There’s nothing more blissful than walking into a clean and healthy bathroom. It’s one of life’s simple pleasures. 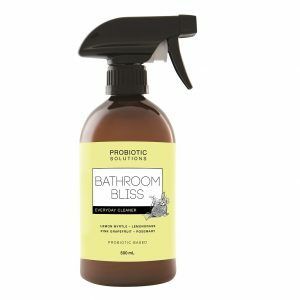 You will discover this feeling with Probiotic Solutions Bathroom Bliss, where the millions of friendly bacteria sort out the bad bacteria on every surface, turning your bathroom into a healthy environment for your family. Although, nobody likes spending hours on their hands and knees scrubbing grimy tiles and icky toilets. 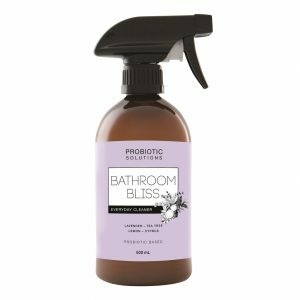 With Bathroom Bliss, millions of friendly bacteria do all the hard work for you. Once you’ve sprayed a little here and there, the good guys have a meeting with the bad guys and sort things out. It’s like a mediation session between bacteria. It does a fabulous job at keeping surfaces clean, plus soap scum and oils won’t build up. It also smells blissful.